2016 was a year that started with a huge high as we witnessed the majesty of the Piano & Microphone Tour and then tragedy struck. Since then we have been dealing with the absence of our favourite musician and artist, Prince. 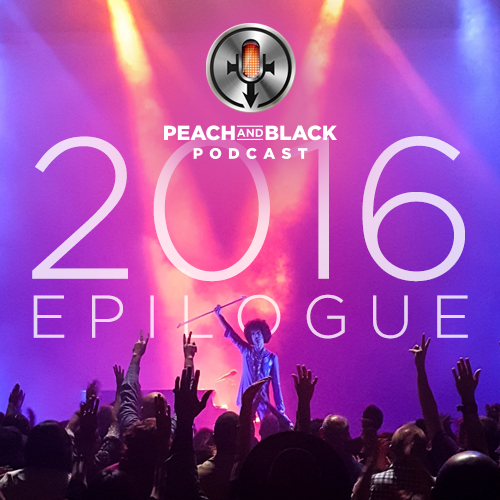 We sat down to discuss the year that was and here is our 2016 Epilogue Show. Rest in Peace Prince - with love there is no death. This entry was posted on Friday, December 23rd, 2016 at 8:33 pm	and is filed under , Music, prince, podcast, NPG, New power generation, prince and the npg, 3rd eye girl, prince rogers nelson, peach and black podcast, prince podcast, album review. You can follow any responses to this entry through the RSS 2.0 feed. Both comments and pings are currently closed.